Last week I attended a Maintainerati event, an unconference/mini-summit for maintainers of popular software, run as a prelude to the GitHub Universe conference. After being brought up to speed on this year's secret handshake of the software elite, I had a great time in the documentation breakout group, as well as moderating a lively discussion on diversity in open-source, both of which deserve their own write-ups at some point. Discussion is one of the greatest things about GitHub, but as Jupyter developer Ian Rose brought up, an email for every comment can be overwhelming. Daily or weekly digests for issues, or even for all your GitHub activity would be a huge improvement, especially for more lightweight users of GitHub. This may not strike subscribers of The Weeklypedia as a surprise, but I am a big fan of email digests. More control over engagement levels could open a great new avenue for driving traffic for GitHub, too. Right now you can either star repos or watch them, effectively getting no notifications or all of them. I'd estimate about a third of the repos I star look interesting, but haven't yet reached the point where I'd use or contribute to them. So they mostly get starred and forgotten. 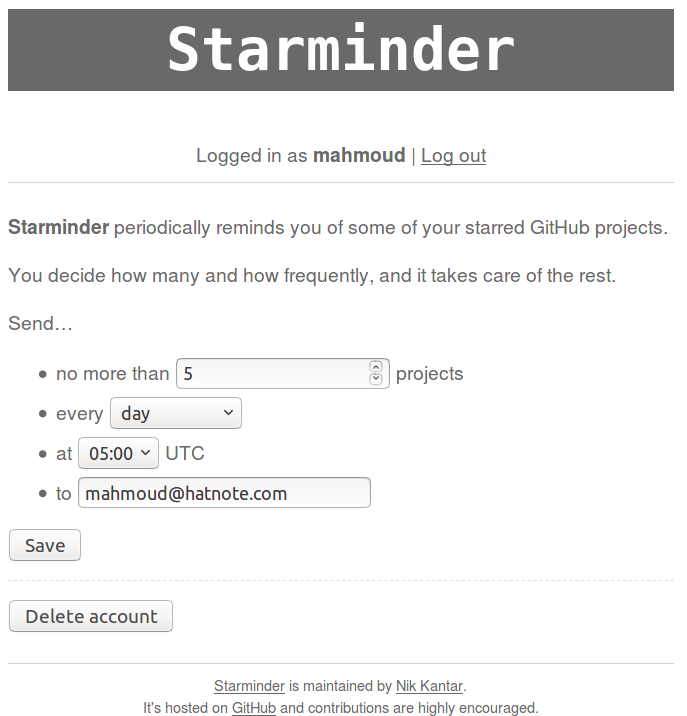 A friend of mine started a little project called Starminder, which emails a nightly selection of five of my starred repos. I've been having a grand time revisiting these old stars and seeing how far they've come, even reminding me of features I was waiting to build. And while I love Nik's work, instead of relying on Starminder, it would be way better if I could tell GitHub roughly how often I'd like updates on a project, and then get Pulse-like info delivered to my inbox on a weekly or monthly basis. Commit activity, high-traffic issues, and especially new tags/releases are all things I'd be very excited to get personalized, periodic updates on, without having to get every single notification as a separate email. One off-the-cuff idea I had was to establish some sort of star gradient, with the basic star without notifications being an option on one end of the opt-in engagement spectrum, and full-blown, every-notification "Watching" on the other. Could there be one Star dropdown to rule them all? A senior developer not involved with the project files an issue requesting a feature. I would like them to review the implementation to ensure it does what they want. The senior developer has a busy schedule and doesn't want to join the project and get a bunch of notifications, but would be qualified to review the code. A novice developer finds an problem in the documentation, they could review the new documentation for clarity. Their lack of experience makes them best qualified to review. The core maintainer implements a feature, but is actually the only developer on the project. Requesting a code review from non-project-member peers is a great way to get them to look at the code and become more involved with the project going forward. For bonus points all permissions could have an option to be time-limited. Designated reviewr and expiration possibilities notwithstanding, I think the best flow would include the ability to add someone to a specific PR as reviewer, without giving them any project-wide permissions. I'm probably weird for doing this, but I habitually visit the normal github.com logged-in landing page, aka the dashboard, several times a day. Now, for the few of you who share my habit probably noticed, there's a new Discover tab, offering personalized suggestions of repos to star. Follows - I have the better part of a thousand followers, but I can't remember if I've ever seen a notification about this. They seem like nice folks! Stars on org-owned repos - There are several repos I maintain and watch, but for which I've never seen on-dash notifications. What do they all have in common? They're all owned by organizations (e.g., python-hyper). Other types of notifications show up, but not stars. Watches - Not sure I've ever gotten a notification for someone watching one of my repos, even though they're probably more interested in collaboration than the average stargazer. Any or all of these would certainly make my github.com itch yield more interesting results, and I'm sure there are some enhancements I've missed, too! Just wanted to say thanks to GitHub for putting together such a great event. Whether or not any of these features materializes in the near future, it was so nice to meet up with old friends and make some new ones, too. Focused, cross-technology encounters like these are all too rare. For my Python readers, let this serve as a reminder to get out and interact with other stacks. Python's strength is its integrative nature, and I think that can be a strength for us Pythonists as well. In any case, thanks for the event, GitHub! Hope to see you again next year!